Mo Nishida describes a childhood memory in the Santa Anita Assembly Center, California, which led to his mother's nervous breakdown. 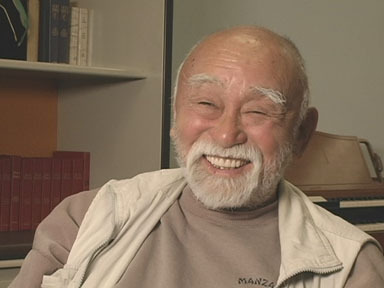 Mo Nishida's full interview is available in the Densho Digital Archive. Clandestine photographs from war in Iraq prove a long-known fact: images of soldiers in battle, prisoners of war, and civilians caught in the conflict have the power to provoke outrage, sorrow, patriotic fervor, and myriad other emotions. If a government is to manage the public's perceptions of a war, it must control the photographs that appear in today's newspapers and tomorrow's history books. more easily manage the dissemination of wartime photographs. To document the round-up and incarceration of Japanese Americans after the attack on Pearl Harbor, the War Relocation Authority (WRA) hired Dorothea Lange, best known for her wrenching photos of Dust Bowl farm workers taken for the Farm Security Administration. Lange was an odd choice, given her leftist politics and strong sympathy for victims of racial discrimination. Appalled by the forced exile, she confided to a Quaker protestor that she was guilt stricken to be working for a federal government that could treat its citizens so unjustly. Her reason for taking the assignment was a desire to accurately record what the Japanese Americans were undergoing. Apart from a few photos that reached the public, she was thwarted in that attempt. A few years ago, nearly 800 of Lange's WRA photos were unearthed from the National Archives, which impounded them over a half-century ago. Lange was required to turn over all her prints, negatives, and undeveloped film. Frustrated that her photos of life at Tanforan, Manzanar, and other sites would not be published, Lange concluded the government wanted a record but not a public record of the camps. 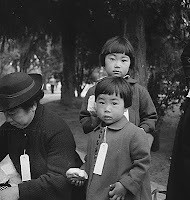 Perhaps by stamping Lange's photos "impounded," the government indicated it wanted a different record - not Lange's shots of dejected elders, bewildered children, and glum young men. Not a record of patients on cots left by a latrine, of schoolchildren kneeling on the floor because there are no chairs, and of young and old standing in endless lines in the heat and dust. 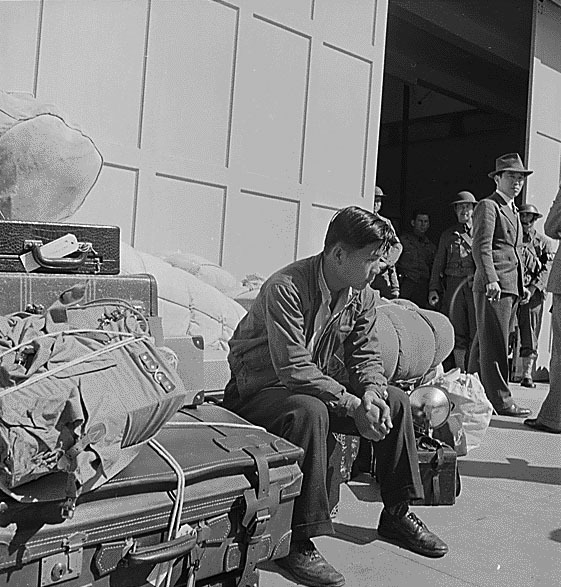 The propaganda machine shifted gears when the WRA started reintroducing designated loyal Japanese Americans into free society. WRA photos depict an Americanized, unthreatening population, the same race that war propaganda posters had taught the public to fear. Images of baseball games and marching Boy Scouts abound, along with high school girls competing as beauty queens, and industrious women sorting donated Christmas gifts. Not a trace of Japanese culture appears, and certainly no sign of resistance makes it into the photos approved for public consumption. 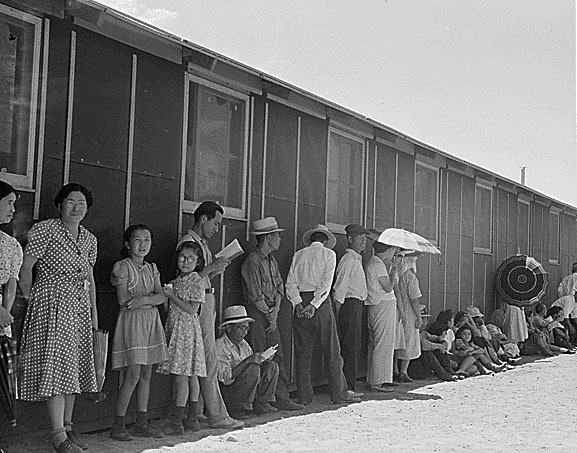 In contrast to Dorothea Lange, the famous landscape photographer Ansel Adams was invited to come and go as he liked while photographing Manzanar in 1943. Although extremely supportive of the WRA, he too was not allowed to photograph the guard towers and fences. Lacking Lange's compassionate eye and civil libertarian's anger, Adams portrayed the inmates ' stoicism. He avoided crowd shots that conveyed mass indignities and discomfort in favor of uplifting portraits of well groomed young men and happy families. 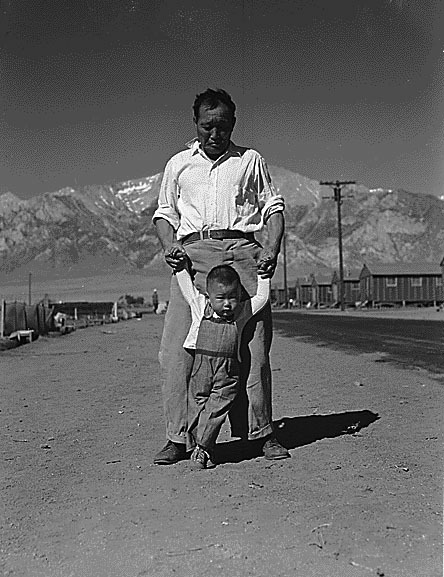 "The acrid splendor of the desert, ringed with towering mountains, has strengthened the spirit of the people of Manzanar,"2 Adams declared. (He was speaking of the camp where guards had killed two men and shot nine others during an uprising months earlier.) Adams was pleased to comply with a request from the Office of War Information for photos "showing American kindness to Japanese...urgently requested to combat Japanese propaganda which claims our behavior is monstrous. 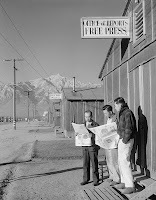 "3 Adams's sunny photo of men reading the Free Press, the censored camp newspaper, is devoid of irony. Documentary photographers, shaping their images at every step, know there is no such thing as a truly objective photograph. It is no accident that Adams's young man is shot from a low vantage point, appearing all the more proud against a vast sky, while Lange's disheveled young "evacuee" is viewed from above, an angle that emphasizes his drooping shoulders. 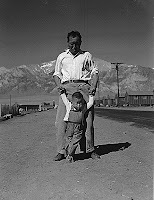 Adams believed the vista beyond Manzanar's gates expressed "the immensity and opportunity of America"4; Lange grimly recorded a collective, egregious injustice. purpose. 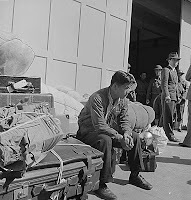 Dorothea Lange herself asserted that a documentary photographer has a responsibility of "keeping the record and keeping it superbly well," but she admitted, "Everything is propaganda for what you believe in, actually, isn't it? ...The harder and the more deeply you believe in anything, the more in a sense you're a propagandist. Conviction, propaganda, faith…I never have been able to come to the conclusion that that's a bad word." This article was originally written in February of 2007 by Densho staff member Megan Asaka. 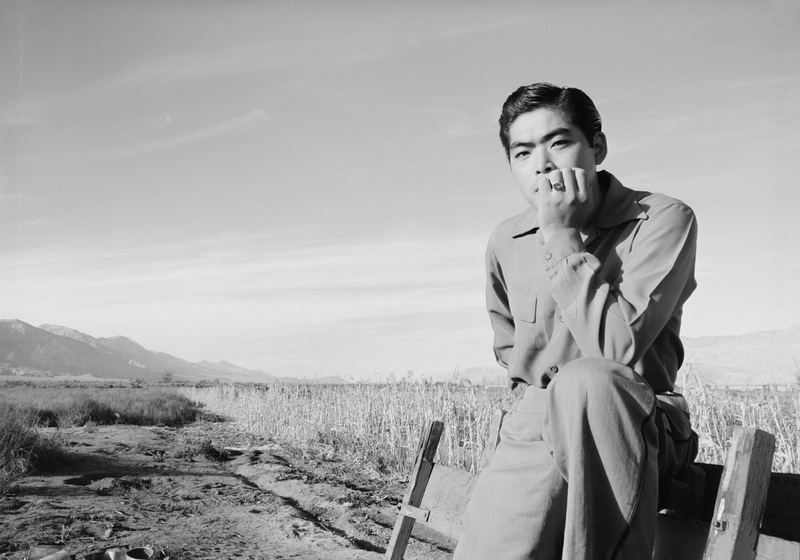 Since then, several books have been published examining the work of Adams and Lange, including Moving Images by Jasmine Alinder, and Japanese-American Resettlement Through the Lens: Hikaru Iwasaki and the WRA's Photographic Section, 1943-1945 by Lane Ryo Hirabayashi, Hikaru Iwasaki, and Kenichiro Shimada. It should also be noted that according to Professor Roger Daniels, the National Archives allowed access to Lange's photos shortly after the Archives received these photos, including the ones stamped "impounded."